I’m pretty lazy when it comes to fitness. It’s not that I don’t want to be in good shape, it’s just that I don’t want to spend a lot of unnecessary time working out if it’s not necessary. This led me to try a bunch of different workouts and read a lot of books trying to find the easiest ways to stay in shape, and I’ve narrowed down them down to these top 8 tips. Using these tips I’ve been able to keep a 6-pack for the last 10 years. Although there are periods where I will workout a lot, on average I’ve been able to do this while working out less than 2 times per week. The whole idea that eating fat will make you fat is a complete lie. I eat 2 to 4 tablespoons of grass-fed butter per day, and since doing so my 6-pack has almost turned into an 8-pack – all without working out any more. Eating good fats (grass fed butter, avocados, other high-quality, non-processed fats) keeps you full longer, increases your metabolism, and actually makes you happier (seriously!) If you only take away one thing from this article it should be this. Alcohol calories go straight to your gut, especially beer. There is a reason it’s called a “Beer Gut.” If you like to drink switch to vodka. When I left for college at 18, I thought about all the alcohol I would be drinking over the next 4 years. I figured that if I drank vodka instead of beer I’d come out of college looking much better than if I did that latter – and it worked. Vodka is just alcohol and water. If you’re going to be drinking, it’s the best thing for you. I took this tip from Tim Ferris book 4 Hour Body, so I won’t go into tremendous detail here, but there is a hormone in your body, that when triggered, tells your body to send excess calories to your muscles for repair instead of storing it in fat. You could run for 2 hours to spike that hormone in your body, or you could do 40 squats. So if I’m eating out and about to consume a huge, heavy meal, I’ll walk off to the bathroom jump in a stall and bang out a quick 40 squats. Does this make me look weird, maybe, but no one sees me do it, and it works. I’ll take weird guy with a six-pack over normal guy with a beer gut any day. I’m not saying running is bad, but if you’re looking to get the best results in the least time, running isn’t going to be a good choice. In the same time, you can easily burn more calories lifting weights than running. As an added benefit, for every extra pound of muscle to gain, you burn extra calories each day – even if you’re not doing anything. I like to think adding muscle is like putting money in the stock market. You may not make a lot of money every day, but over time your gains (or lack of weight gain in this case) can be significant. If you want to gain the most muscle the quickest, concentrate on your large muscle groups like your legs and back by doing squats and pull ups. The saying that “abs are made in the kitchen, not the gym” is true, but if you want to get some extra ab definition quickly, I have a quick 5 minute workout I do 3 times per week. I don’t remember where I found this image, but I traced it back to darebee.com. Download this picture to your phone, and set an alarm on your phone for whenever you get up on Monday, Wednesday, and Friday, and knock it out. It’s so short that there is absolutely no excuse why you can’t do it. 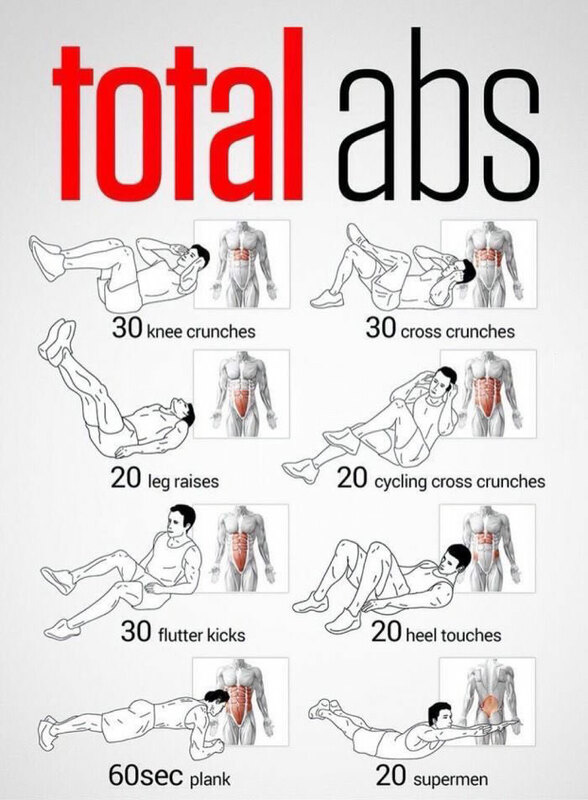 I’ll elaborate on some additional ab workouts in a coming post, but if you don’t normally do a lot of ab exercises, this is a great place to start. People normally eat too many carbs. They’re found in most processed foods, because they have a very long shelf life, which makes them more profitable for food companies. That’s not a good reason to be eating them. Most carbohydrates are high-glycemic foods, which means they cause large spikes in blood sugar. Have you ever felt suddenly tired after a meal? That’s because whatever you ate caused your blood sugar to spike, followed by a spike in insulin. Insulin takes the sugar out of your blood and when you have an insulin spike, it ends up taking out too much sugar, causing you to fee tired. And it continues to get worse, where do you think all the extra sugar goes? It gets turned into fat. I’m not recommending to cut out all carbs, but instead to just be conscious about how much you eat. Eating pasta and bread daily can kill any weight loss gains you’ve made. I used to drink juice with every meal. I thought it was healthy. It’s healthy to eat fruit; juice comes from fruit, so juice must be healthy. Nope. Juice has too much sugar in it. It take 6 oranges to make a 12 oz glass of orange juice. When was the last time you ate 6 oranges in one sitting. Even worse, you consume that orange juice much quicker than you would 6 oranges, which leads to the blood sugar spike talked about earlier. If you don’t normally drink water, it can take a while to get used to the taste (or lack thereof) but it’s one of the simplest changes that can help you stay in shape. It keeps you away from sugary drinks and artificially sweetened ones that can actually make losing fat harder. I work from home, so I keep a REALLY large glass in my office to make it easy to drink a lot of water without having to constantly fill it back up. When Should You Quit your Job for your side Gig? Those are such good tips! Thanks for sharing. These are all such good tips. I definitely prefer an efficient and fast workout! That squatting before eating tip is really interesting! I’ll have to try it! Yes!!! Love these! Such good tips! #3 totally made me LOL! I haven’t heard that one before. Great tips! Definitely needed to read this today! As I sit here drinking a glass of wine… but I am definitely trying to implement more water the past few weeks and it makes a difference. Great tips! I do a lot of these already!! I need to start using these ASAP — I’m so out of shape and need to fix it!